If you record stock events in Cashmanager RURAL online and FarmIQ why not save time and limit data entry errors by entering information once? Stock records are initially captured in your FarmIQ farm and then automatically fed into your Cashmanager RURAL online farm business. The stock sales and purchases automatically feed into the Transaction, Cashflow, and Livestock screens while births, deaths & missing and killed appear in the Livestock screen. In order to use the FarmIQ datafeed, you first need to register your Cashmanager farm business and FarmIQ farm. Log in to the Cashmanager website. Select the farm business you wish to register. Click on the Datafeeds tab. Select Add datafeed from the FarmIQ box. Click on the Login to FarmIQ link. You will be redirected to your FarmIQ farm to retrieve your Token and Farm number. 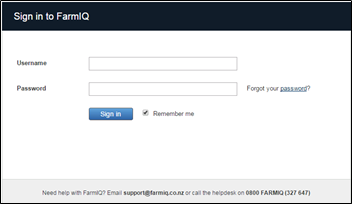 Login using your FarmIQ Username and Password. Click on the Finance tab, select Financial settings and click Manage financial settings from the drop down list. Make a note of the Token (Partner Access) and Farm Number. Click on the Cashmanager RURAL tab on your web browser to go back to the registration page. Once you move back to the Cashmanager RURAL website you will be registered to receive livestock events from FarmIQ, which will arrive daily. Now that you have registered your Cashmanager farm business and FarmIQ farm, the stock codes in each program need to be mapped in order for data to be shared. TIP: When mapping your stock codes it's important to align you FarmIQ codes to the ones in Cashmanager. Log into your Cashmanager RURAL farm business. If you have more than one farm business, make sure it is the database that has been registered for the FarmIQ datafeed. Go to the Transaction screen. Click on Reports at the top of the screen and select the Code List report. We recommend you print this report for referencing when aligning stock codes in FarmIQ. Click on your farm name and select Organisation Home. Click on the Finance tab. Then select the Financial tab. Cashmanager RURAL codes are listed in the Code and Description columns. They contain the Cashmanger RURAL default Stock codes (eg: BEEF – B). The remaining columns - Stock Class, Breed, Revenue Group and Categories contain FarmIQ Stock Class information. Click Edit (Pen image) to change an existing code, so that it matches the Stock Codes in your Cashmanager RURAL farm business. To match your Code List report, Edit the Code and Description boxes in your FarmIQ farm. Tip: To add a new Cashamanger RURAL Stock Code to your FarmIQ farm, click the Add Code button. If the Stock Codes are aligned correctly, your FarmIQ livestock events will be sent to your Cashamanger RURAL farm business. If the Stock Codes aren't aligned correctly, an error will appear and you must align the Stock Codes in FarmIQ in order for the data to be sent to Cashmanager RURAL. Important! Before you register for the FarmIQ datafeed, make sure the stock reconciliation in both systems match. If it's not possible to accurately reconcile the stock events,ensure the closing stock numbers for each stock code match. Login to your Cashmanager farm business. Open the Livestock screen and choose the relevant financial year. In FarmIQ click on the Stock tab. Select Add & Remove stock. Scroll down to Stock Reconciliation. 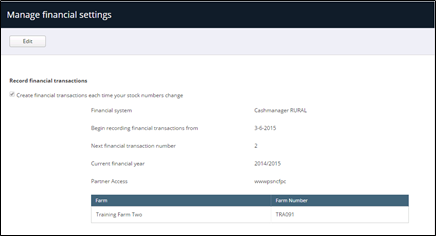 Use the filter menu to show the same financial year as selected in Cashmanager RURAL. Ensure the view Ownership is selected. Use the most accurate and up to date stock reconciliation to edit the corresponding account until the reconciliation for all animal types match.